Northeast Canyons and Seamounts Marine National Monument: Is No Place Sacred? Northeast Canyons and Seamounts Marine National Monument is an extraordinary place. Speak out to preserve this special place and and its awe-inspiring wildlife. Please sign our petition for Northeast Canyons and Seamounts National Monument right now. Northeast Canyons and Seamounts National Monument hasn’t received as much attention as many of the other national monuments that the Trump administration has targeted, so we really need your signature. Please add your name now and help protect vital habitat for endangered whales, sea turtles and other marine wildlife. Whales, sea turtles and other imperiled species need undisturbed places like Northeast Canyons and Seamounts National Monument. People need these special places protected to better understand the history and wonder of our natural world and to honor our commitment to a greener future. Together, we can protect this extraordinary place — and the sea turtles and other unique marine wildlife that rely on these waters for their survival. Please add your name now. 1. President Barack Obama White House Archive, “FACT SHEET: President Obama to Continue Global Leadership in Combating Climate Change and Protecting Our Ocean by Creating the First Marine National Monument in the Atlantic Ocean,” Office of the Press Secretary, retrieved online February 8, 2018. 2. Avory Brookins, “Future Of Northeast Marine National Monument Protections Still Uncertain,” Rhode Island Public Radio, December 7, 2017. 3. Avory Brookins, “Future Of Northeast Marine National Monument Protections Still Uncertain,” Rhode Island Public Radio, December 7, 2017. 4. 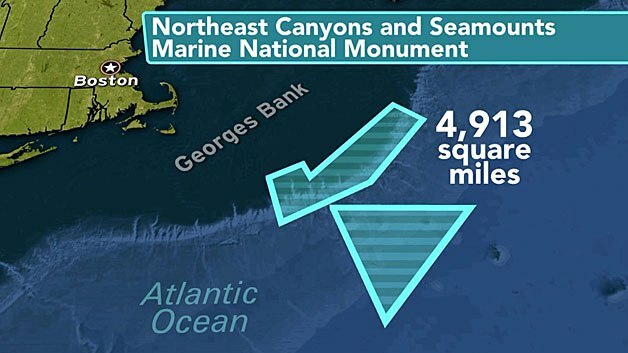 Michael Conathan and Avery Siciliano, “Big Oil Could Benefit Most from Review of Northeast Canyons and Seamounts Monument,” Center for American Progress, July 25, 2017.